A Neighbourhood Plan will enable the local community to shape the future development of the Parish for the benefit of the local community. The Woore Neighbourhood Plan will be a statutory planning policy document supported by a majority of the local population which will enable Woore Parish Council to have a greater and more positive influence on how the Parish develops in the future. For any plan to be considered viable and an accurate reflection of the communities wishes it is vital that residents actively participate in it’s creation. The Planning Group must be made up of Parish residents and not just Parish Councillors. Volunteers are required to form the Planning Group and give general support to the whole process. If we do not get enough support the plan cannot proceed as it must include members of the local community. It is very simple; if there are not enough volunteers we have no voice in the future development of our village. The question which will be asked in the Referendum is: �Do you want Shropshire Council to use the Neighbourhood Plan for Woore to help it decide planning applications in the neighbourhood area?� All registered electors in the Parish may vote - postal votes will be issued to those registered for them. We need parishioners to vote "YES" in as large numbers as possible, so that the Plan you have helped to form can really influence the future of our Parish. Please vote YES on 30th May. The final version of the Plan, to be voted on, can be downloaded here. Applications to be added to the register of electors for this election must be received no later than Monday 13 May 2019. New applications for, or amendments or cancellations of postal votes and amendments or cancellations of existing postal proxy votes must reach the Electoral Registration Officer at Shirehall, Abbey Foregate, Shrewsbury, ShropsApplications to be included on the register of electors for this election must behire, SY2 6ND by 5 pm on Tuesday 14 May 2019. New applications to vote by proxy at this referendum must reach the Electoral Registration Officer at Shirehall, Abbey Foregate, Shrewsbury, Shropshire, SY2 6ND by 5 pm on Tuesday 21 May 2019. The Examiner's Report has now been published by Shropshire Council and is available here. Shropshire confirms the matter is on the Cabinet Agenda for 20th March 2019, following which, if agreed, we understand the Referendum must be held within 56 working days (mid-June). See above. We were delighted to receive (December) this Examiner's Report on our draft Plan. With mainly minor amendments he recommends that the draft Plan proceed to a Referendum of registered electors in the Parish in 2019. The only exception is his removal of our sensitive gaps policy, but we feel this is mitigated by the adoption of a development boundary on the same lines, with all outside it (including the gaps between areas of development) being defined and protected as "open countryside". He has made no changes to the numbers or scale of our housing targets, or to our HS2 policy, that all land is restored to its original state on the completion of work. The Team notified Shropshire Council that it supports proceeding now to a referendum on the Plan as amended, and the Parish Council also did so at its January meeting, unanimously agreeing �Woore Parish Council supports the conclusions of the Examiner's report into the Neighbourhood Plan, and agrees that there may be a need for Shropshire Council to provide additional minor clarifications to the examiner's proposed modifications in order to ensure internal consistency between the Examiner's conclusions and the resulting policies of the Neighbourhood Plan�. This is a very different referendum by the way from the one (whether first or second) currently constantly featuring in the TV News - it will be just us, and what we vote for will happen! John Parmiter, the independent examiner appointed currently assessing the Woore Neighbourhood Plan, has informed us that the plan should be informed by a habitat regulation assessment (HRA) screening assessment. Whilst the impact upon environmental assets has been considered as part of the SEA screening assessment carried out by Woore Parish Council as part of their preparation of the plan, it is now considered necessary for us, as the responsible body, to undertake a specific HRA screening assessment to provide further certainty about the plan�s likely impacts on protected sites. Mr Parmiter has therefore agreed to suspend the examination for a short period to allow us to undertake this process. An HRA screening assessment has therefore been prepared and is being consulted until Friday 7 December. Following the consultation we'll consider any comments made and adjust the assessment if required. The final version of the assessment will then be sent to Mr Parmiter for his consideration, after which he will finalise his report. It's likely therefore that the examination process will be concluded by mid-December. We are delighted to be able to announce that on Friday 10 August, by agreement with the Parish Council and Neighbourhood Planning Team, Shropshire Council was able to make the appointment of Mr John Parmiter as Independent Examiner of the Draft Neighbourhood Plan for Woore Parish. We await his comments. Responses received by Shropshire Council and passed to the Examiner have been posted on their web site. This Consultation has now ended. Thank you to all those who responded. Woore Parish Council (through the Neighbourhood Planning Team) has prepared a neighbourhood plan in accordance with Regulation 15 of the Neighbourhood Planning (General) (Amendment) Regulations 2015. On 29 May, this neighbourhood plan was submitted to Shropshire Council. The submission of the Woore Neighbourhood Plan is accompanied by a basic conditions statement, a consultation statement and an SEA screening opinion. Please follow the links on this page to view the submitted documents. Click on the 'How to get involved' tab on the page. Representations must be received by Shropshire Council no later than 5pm on Tuesday 24 July 2018. Representations received after this date will not be considered. You can also use the downloadable feedback form. Representations must be received by Shropshire Council no later than 5pm on Tuesday 24 July 2018. Representations received after this date will not be considered. As part of your representation, you can request to be notified of the Council's decision on whether to make (adopt) the neighbourhood plan under Regulation 19 of the Neighbourhood Planning (General) (Amendment) Regulations 2015. Following the consultation, Shropshire Council will collate and submit all the responses received and send them to the appointed examiner, along with the submitted documents, for examination. Following the examination, the appointed examiner will produce an examiner�s report and recommend whether the plan can be put to a public referendum or not. The council must then consider the examiner�s report and make a decision on whether to put the plan to public referendum or refuse it. If agreed, the council will arrange a referendum. If more than 50% of the votes at the referendum are in favour of the plan it will form part of Shropshire Council�s Local Development Plan. The Team worked through responses received in the consultation on the draft Plan, determined their view on each, and how to incorporate those which were accepted in the final draft. Many thanks to all who attended the session in the Victory Hall for their comments and support. 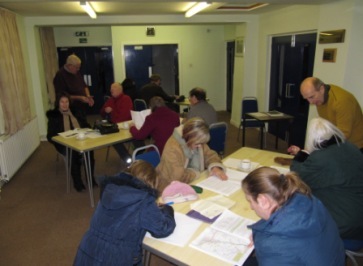 Woore Neighbourhood Planning Team, as the Steering Group, acting in conjunction with Woore Parish Council, and with the help of the local community, has prepared a Neighbourhood Plan (the Plan) for the period to 2036 for Woore Parish. The Civil Parish of Woore includes several other hamlets and villages, notably Pipe Gate, Gravenhunger, Dorrington, Ireland's Cross, Bearstone and part of Onneley. The Plan sets out a vision for the future of the parish and planning policies which will be used to determine planning proposals locally. Woore Neighbourhood Planning Team and Parish Council are now inviting comments on the proposals in this Pre-Submission version of the Plan before it is submitted to Shropshire Council for formal consideration and wider consultation. Woore Country Store, 11 The Square, Woore, CW3 9SD - or on written/email request. An online version of the Plan can be viewed on this Neighbourhood Planning Team website at http://www.woorenpt.org.uk/WooreReg14Jan2018.pdf and the Neighbourhood Plan pages of the Woore Parish Council website at http://www.wooreparishcouncil.org/community/woore-parish-council-10149/neighbourhood-plan1/. Feedback forms are available to download at the above websites, and will be provided at a public Drop In Session at Woore Victory Hall, London Road, Woore, CW3 9SF from 6 - 8 pm on Wednesday 7th February 2018 with members of the Team available to display printed copies and answer questions. a) Your comments will not be taken into account unless your Name and Postcode, Organisation or Body if you are not an individual, and Consultee Type, are included. Additional information is optional, but will greatly assist us in analysing responses to the consultation. b) Please make additional separate representations if you are responding in different capacities. For example, you are an individual, but you are also representing an organisation or body or business, or you may be any other consultee type. All comments will be publically available on Woore Neighbourhood Planning Team website page after the consultation period and when the Submission version of the Plan is released to Shropshire Council. Comments will be identifiable by name, organisation or body and consultee type (resident, business, other body, etc.). All other personal information provided will be protected according to the Data Protection Act 1998, and will not be made available online or otherwise. Thank you for taking the time to provide comments on our Neighbourhood Plan. The Team agreed a final version of a first draft of the Plan and things are now moving rapidly. The six week consultation period on the draft Plan will begin on 22nd January 2018, with copies of the draft being available on the Neighbourhood Plan and Parish Council websites from that date, and comments being invited (pro formas also available on the websites) until this stage of consultation closes at 5 pm on 5th March 2018. As promised, there will be a public Drop In Session, on Wednesday 7th February in the Victory Hall, from 6 - 8pm, with printed copies of the Plan and the Comments form available, and members of the Team to respond to questions from residents. On past form we can expect another good turnout on the night. There will also be a couple of printed copies in the shop on the Square throughout the six week consultation period, or access to one can be requested through our web site. The Team worked through the latest draft of the Plan, which, apart from more detailed maps, is now almost in the necessary state for submission for consultation. This and careful proof reading are the only tasks remaining before we can circulate a draft for official comment. These tasks can mostly be completed by correspondence or in small groups rather than in public meetings. The Team displayed and members were present to discuss with residents the analysis of replies to the Big Questionnaire and first drafts of Policies for inclusion in the Plan itself. 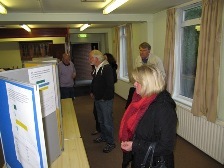 Members of the Team thank all the residents of Woore Parish who came to the Drop In Session on the Neighbourhood Plan. 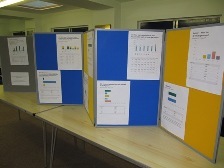 We were able to display the results of the Big Questionnaire, demonstrating the breadth of response and the statistics which support inclusion of particular policies in the draft Plan, which we were able to discuss with those attending. The Team will discuss drafts of sections of the Plan, and arrangements for the Drop In Session in October. We drafted this vision and objectives from the responses that we received from the initial short questionnaire, which was made publically available at the drop-in session on the 27th February 2017.